Rhett and I ran into a disagreement Google could not solve for us. We were going to breakfast at Luke’s Joint, which led to a discussion about what used to be in that vicinity. Both Marino’s and NEC burned down over there. I think Marino’s was where the glassblowing place is now or the H2O bar (is that still open? ), and he thinks it was where the chain link fence and the empty lot are. Can you solve this for us? By the way, that was the best bar on the plaza. It didn’t stink like Toby and Jack’s (what is that smell?). 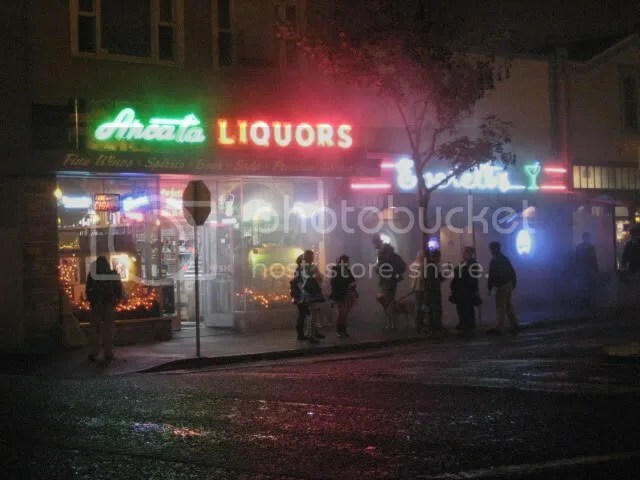 It wasn’t a meat market like Sidelines, it didn’t cater mostly to a specific sexuality, and back then Everett’s was the old people bar. Now Everett’s is the best because it has Betty. This entry was posted on March 6, 2011 at 7:04 pm and is filed under community, Humboldt County with tags Arcata, good bars, plaza. You can follow any responses to this entry through the RSS 2.0 feed. You can leave a response, or trackback from your own site. He’s right – Marino’s was where the empty lot is now. Thank you, I will be sure to tell him right away. (yeah right) Thank you also for the article, it made me realize my mistake in thinking the NEC and Marino’s were two separate fires.